Pumping oil and gas from miles beneath the surface requires millions of dollars of equipment and months of around the clock work. The remoteness and the climate of drilling sites often make this already difficult job even more challenging. Oil and gas businesses must set-up equipment-enclosures and temporary living spaces everywhere from deep jungles to icy tundra—frequently far from the conveniences of modern infrastructure. Keeping employees comfortable is key to maintaining productivity, yet ensuring high living standards quickly becomes a challenge in harsh climates. Traditional mobile homes may begin to leak under a North Dakotan snow load or an equipment enclosure’s climate control system may struggle with the heat of a Texas summer. 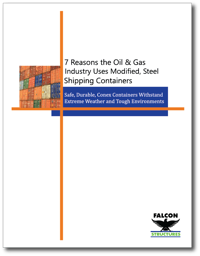 The difficulties associated with drilling sites make modified shipping containers a cost-effective solution for businesses seeking structures rugged enough to withstand the weather yet comfortable enough to keep workers and resources safe and productive. Consider the Bakken oil plays of North Dakota, Montana, and Saskatchewan. Energy companies drill for oil and gas in weather that ranges from 100 degree Fahrenheit summers to 0 degree Fahrenheit winters. Most housing around the Bakken oil play is temporary, but many people in the oil and gas industry report that trailers and mobile homes are simply not built for the harsh winters. Imagine coming home after a twenty-hour day, only to find that the hot water has failed. Such issues are not uncommon for oil and gas workers. Modified shipping container workforce housing and offices provide the mobility of temporary housing without sacrificing functionality. Further, equipment and utilities are just better protected behind 16-gauge corten steel than vinyl paneling. Right from the start, modified shipping containers reduce set-up costs. Once placed on-site by a crane or forklift, connection to utilities is fast and simple. In addition, the protection and specially-selected climate control systems of modified shipping containers lead to fewer calls for plumbers and electricians in the long term. The initial costs of modified shipping containers are already competitive with mobile homes, but containers become even more cost-effective when businesses account for the lower total cost of ownership thanks to lower operation and maintenance costs. Resistance to snow and precipitation. Turn-key electrical and plumbing hook-ups. Custom pass-through openings for utilities. If you have questions about using a modified shipping container to protect your equipment, contact us or call our expert sales reps at 877-704-0177. We’re happy to provide a free, no-obligation quote for your project.